Cowboy Action Shooting TM is a multifaceted international shooting sport in which contestants compete with firearms typical of those used in the taming of the Old West: single action revolvers, lever action rifles and side-by-side double barreled, pre -1899 pump or lever action shotguns. 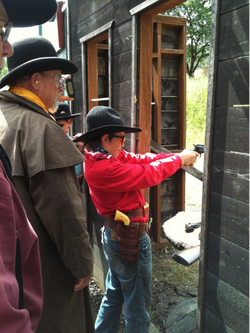 The shooting competition is staged in a unique, characterized, "Old West" style. Contestants shoot in several one- to four-gun stages (courses of fire) in which they engage reactive steel and cardboard silhouette targets. Scoring is based on accuracy and speed. The truly unique aspect of Cowboy Action Shooting (tm) is the requirement placed on authentic period or western screen dress. Each participant is required to adopt a shooting alias appropriate to a character or profession of the late 19th century, or a Hollywood western star, and develop a costume accordingly. Shooting categories under S.A.S.S. (Single Action Shooting Society) rules are based on shooter’s age, shooting style, propellant, outfit and equipment…including revolver sights and model of rifle used.